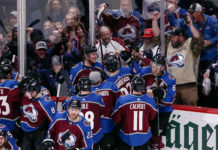 Avalanche fans got a taste of what playoff hockey looks like on Saturday afternoon. Hard to imagine they didn’t like what they saw. 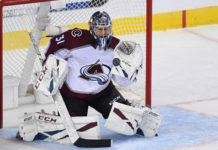 Semyon Varlamov stood tall in net with 39 saves, and added another three in the shootout as the Avalanche were able to pull out a important 2-1, shootout victory against the Vegas Golden Knights, a team they could face in the postseason. Gabriel Landeskog would score the only goal in the shootout, giving the Avs 90 points on the year and giving them a three-point lead over the St. Louis Blues. From the drop of the puck, you knew this game was going to be exciting. Both teams came out flying, as speed is a huge staple for both clubs, and for the first two periods, the Avalanche were the better team. 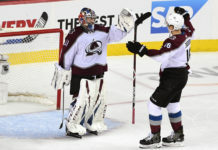 That speed allowed the Avalanche to draw two early penalties on the Golden Knights, and on the second power play, the Avs second power play unit would come up big. Alexander Kerfoot would make a great play along the boards, sending a blind spinning pass to the slot, where J.T. Compher would corral it, send it over to Carl Soderberg, and Soderberg would bury it top shelf to give the Avs a lead early. Soderberg had missed the previous two games, and his absence was very noticeable. The second period was more high-flying hockey that the Avs would control, but neither team would be able to find the back of the net. The Avs’ best chance might have been when Alexander Kerfoot would toe-drag his way into the slot and hit J.T. Compher, who would just miss on the backdoor. The Avalanche would head into the third period with the lead, but after controlling 60% of the even-strength shot attempts through two periods, probably deserved a better fate. The lead, unfortunately, would not last long. Just moments after Marc Andre Fleury would rob Gabriel Landeskog, Jonathan Marchessault would enter the Avs’ zone, fake out Patrik Nemeth, and beat Varlamov on the glove side, tying the game up. From that point on, the intensity kicked up a notch… or ten. The teams would trade chances back and forth all throughout the period, with Vegas getting the majority of them. Their best chance came late in the third, where Marchessault would find himself all alone in front after a Landeskog turnover, but Nikita Zadorov would use all 6’5″ of his frame (as well as his gigantic stick) to stop Marchessault from depositing the puck into the wide-open net. The game would head to overtime, and the excitement would not stop there. Erik Johnson would find himself getting stopped on a breakaway by Fleury, and Nathan MacKinnon would have two attempted breakaways broken up by the Vegas defense. On the other end, Semyon Varlamov would stand tall and stop everything thrown his way. The game would not be decided in 65 minutes, and the Avs would head to only their third shootout of the year. Varlamov would continue to be a wall, stopping David Perron, Erik Haula, and Marchessault on Vegas’ three attempts. For the Avs, MacKinnon and Mikko Rantanen would not be able to find the net, leaving the game on the stick of Gabriel Landeskog, who was outstanding all night. 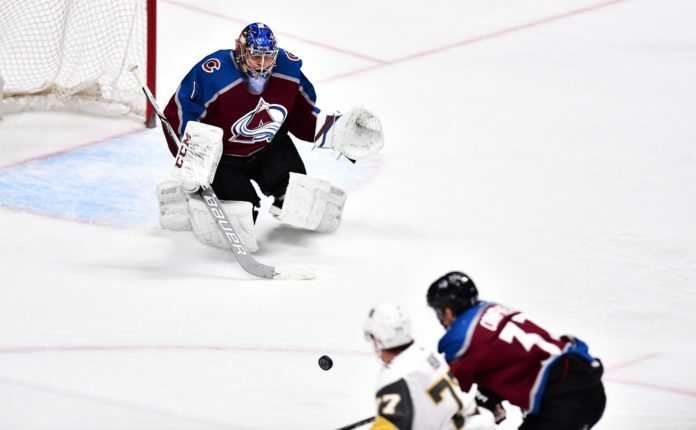 He would come in down the right side, cut to the middle, and deposit the puck past Fleury on the blocker side, giving the Avs a huge 2-1 victory. This game was a fun preview of what a playoff series between these two teams could be, but they don’t have to wait long to see each other again. The two teams face off again on Monday night, this time in Vegas. The game starts at 8 PM MST. Mark Alt would dress for his first game in Avalanche uniform, and didn’t look out of place. He started the game as the 7th defenseman, but would find himself getting regular shifts in the second and third periods. Because Sven Andrighetto and Colin Wilson missed today’s game with mystery lower body injuries, the Avs went with a non traditional lineup of 11 forwards and 7 defensemen. Duncan Siemens would barely play, finishing the game with only 3:42 of ice time. The Avalanche got major contributions from their “Kid” line, and as the trio of Tyson Jost, Compher, and Kerfoot would finish as the Avs best possession line. Jost himself ended up controlling 76% of the shot attempts while on the ice at even strength. Jonathan Bernier is now injured again, this time with an infection due to a cut. That means it’s still Semyon Varlamov’s net. He looked exhausted after the game, but because it was in the afternoon, will get a little bit more rest before Monday. Nikita Zadorov bounced back from a rough performance on Thursday by leading the Avs in even-strength ice time with over 20 minutes, and being their top possession defenseman.